It’s not news that the streaming market is a bit heavily populated at the moment, with companies like Netflix, Amazon, Vudu and Hulu all vying for a piece of the rapidly expanding streaming video pie. While the services boast some differences- be it in pricing, content or exclusive licenses, few have a very strong social element to their business model. New streaming site Flickme.com launched this week, hoping to combine the two massive trends- streaming and social media- to grab some streaming video market share. The site plans to harness some of the power of sites like Facebook and Twitter as streaming platforms for Flickme content, and the company has already licensed content from two major studios. Per a press release, Sony and Warner Bros. are both on board to supply content to the social streaming service. 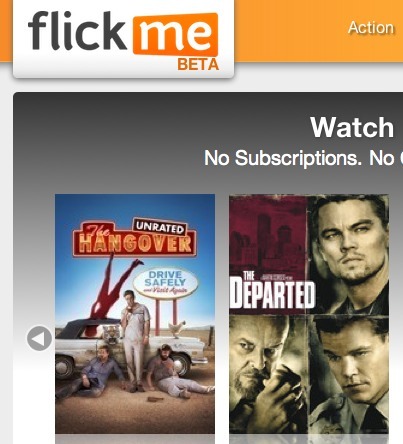 Flickme will carry newer, in demand titles that competition often lacks, and users can connect with Facebook to follow friends who like similar content, make recommendations, earn badges, and share discounts on rentals. And while films rent for about $4 for new titles and $3 for older ones, if friends recommend a title, the cost drops to about $1.50- a feature available for about one-third of Flickme’s content. The company was founded earlier this year by Galbraith and Mark Smallcombe and is funded by Sequoia Capital.